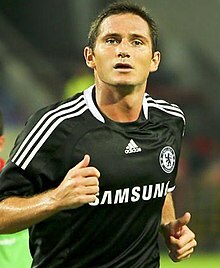 Is iar-imreoir sacair é Frank Lampard. D'imir sé le West Ham United Football Club, C.P.D. Dinas Abertawe, Chelsea, Manchester City Football Club, Football Club Cathair Nua-Eabhrac agus le foireann násiúnta Shasana. Rugadh i Romford, Londain é ar an 20ú lá de mhí Meitheamh, sa bhliain 1978. Tá sé ag siúl amach le cailín Éireannach, Christine Bleakely. Bhí a athair, Frank, ina imreoir leis an bhfoireann West Ham United. Tugadh an leathanach seo cothrom le dáta an 6 Nollaig 2017 ag 02:49.